Before I get started here, I want to say something up front. The article about getting a wicked sharp chisel didn’t even pay a nod to the scary sharp method. Anyhow – I needed to sharpen some chisels so I decided to be your guinea pig. You flatten the back of the chisel graduating from 80 to 220 grit going in one direction only until you switch grits. Then you pick an entirely different direction. Now that your honing surface is prepared, and the back of your chisel has been flattened, it’s time to pull out the honing guide you bought from a woodworkers store. The one I bought at Woodcraft doesn’t fit most of my chisels. I had to improvise. If you draw a short line on a piece of wood at 1 3/16 inches from the edge, you should be able to set the business edge of the chisel against the line and clamp the guide to your chisel so it buts up against the side of the wood. That’s about 25 degrees. After that – sand away while graduating the sand paper. Switch the chisel to add a second bevel of about 32 – 35 degrees to the business edge like the second picture shows. Ok – I repeated the instructions just in case any of you want to check out a scary sharp website. You don’t need a subscription to do that. The next day I took a peek at my daughters Juniper Headboard I was working on. I found a few beads and beads of died on glue squeeze out in the those tricky inside corners. I just pressed the chisel into the right angle from both directions and nipped the excess glue right out. There were glue stains in a few spots were some of the squeeze out was a little much. I took the chisel and shaved off a paper thin strip of wood from those sections and presto. The glue stains were gone. I had some bits of bark left on my natural edges. I sliced that off with the chisel as easy as can be. I said what the heck and debarked the rest of the slabs in record time. After spending about 2 hours with the chisel on bark and left over sap I cleaned it up and ran the second bevel though the 3 grits of sand paper. The next day. I tapered the foot board posts with a table saw sled. Uh oh. I had about an inch too much wood. I grabbed my touched up chisel and a mallet. I very quickly taped off most of the wood. No tear out. I then shaved most of the rest of the excess wood off with the same chisel. Ten second of sanding later and the tapers were perfect. Mind you, the following images is what the chisel can do after finishing 32 tapers on the top and bottoms of the bedposts. 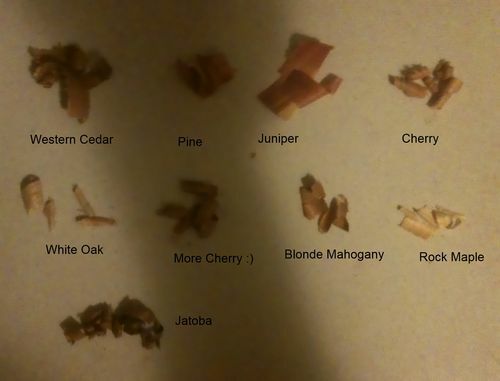 The first shavings are western cedar, pine and juniper (aromatic cedar). The chisel is still sharp enough to slice through those soft woods. Next I have cherry, oak, cherry (doh!) blond mahogany, rock maple and jatoba. I expected issues with the oak, maple and jatoba. Only the maple gave me any kind of quarrel. Imagine if I honed down to a 2000 grit instead of 220. 5 for easy to follow instructions and pictures. 4.5 for content – they used sand paper to take off the excess metal bead. I stropped in with a piece of leather. 3.0 for not giving credit to those who maintain those excellent websites about putting a razor sharp durable edge on their tools. Thanks for reading – I need to ice down my toe again. Looks exactly the same as Scary Sharp EXCEPT sanding in ONE Direction per Grit, changing to another direction for next Grit, etc. I missed the way the piece of wood, with the line 1-3/16 drawn on it, works… I can’t see how it helps do anything. Do you cut a slant on the wood? I can’t see the meaning of drawing the 1-3/16” line. ... maybe a picture would help? I don’t know. I take it that you Sand the beveled edge against the same Grits using the same ONE Direction per grit? Thank you… every little bit we can improve this process, HELPS! I kind of summarized the article but I can definitely see how some of my poor explanations can cause confusion. For starters, only the back side of the chisel gets that treatment. The bevels are just drawn back in one direction. As for using the line. 1 and 3/16 inch line, I believe you’re right. A picture is worth a thousand words. Hope it helps. That distance gets the angle to pretty near 25 degrees. I forgot to answer a question for you. I’ve subscribed for 5 years or so. Nowadays, I find the articles a little too remedial. They have also started adding automotive articles. I’m not much interested in an article on changing the oil in the car. Once my subscription expires, that will be the end of it. 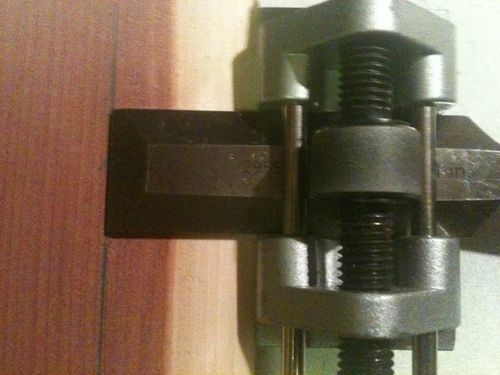 You push the Honing Jig up against the wood, extend the blade TO the line, & screw the Chisel in place. ... to set to 25 degree angle! Simple, EASY, way of NOT NEEDED Multiple fingers, etc. to get it adjusted!! 3. Label the Line for That Chisel! Now, you have all of your chisels set for an EASY SETUP in the future! FYI: The Scary Sharp method of sanding... on my website, posted a few years ago. Looks like you’ve found your solution as to sharpening—congratulations and thanks for sharing. Thanks for sharing the article, your in-depth experiences and antidotes. My grandfather taught me the art of keeping your irons sharp. (pretty much the ‘scary sharp method’ before it received that nom de plume).